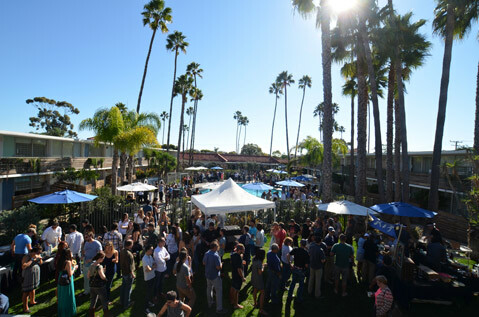 A scene of Ramenfest 2015 at the Goodland Hotel in Goleta. 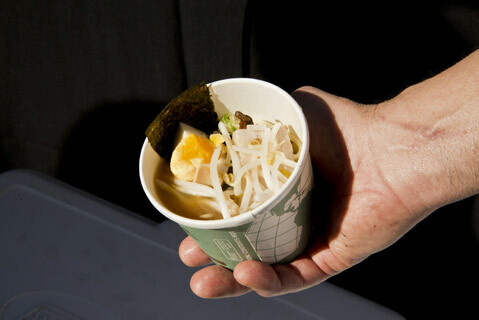 Hundreds of people gathered together to celebrate all things ramen on Saturday. It didn’t matter if it was the perfect 75 degrees out — people enjoyed sitting and walking around poolside, slurping noodles of all sorts. Sama Sama Kitchen, which will reveal its new menu in less than a week-and-a-half, won the King of Ramen title, but all participating restaurants deserve to be the Princes. 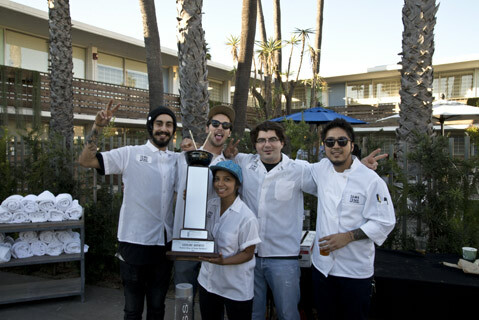 The Sama Sama team, crowned King of Ramen at Ramenfest 2015. Julienne/Wildwood Kitchen: The chefs of Wildwood Kitchen, being opened soon by Julienne’s co-owner Justin West, wore Julienne shirts but handed out Wildwood Kitchen business cards. What else did they hand out? Smoked brisket ramen with bok choy kimchi, shoyu dashi, and hardboiled egg. Special ingredient: The perfectly tender smoked brisket. 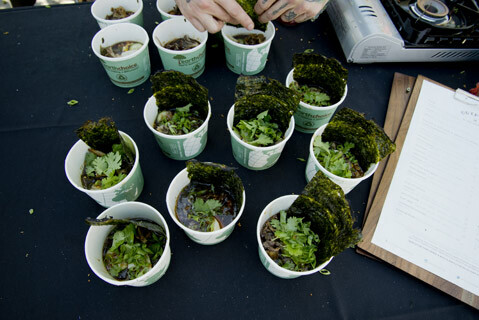 Outpost at the Goodland: As event-hosting Chef Derek Simcik toasted seaweed right in front of your eyes, the other men of Outpost prepared gluten-free vegan noodles with mushroom, cucumber, corn, bok choy, garnished with cilantro. Special ingredient: The flavorful broth resulted from the mix of all those ingredients. Black Sheep: After asking “Duck or pork belly?”, the cooks at Black Sheep served simple thick noodle ramen with marinated egg and mushroom. Special ingredient: The marinated egg that was cooked to perfection. Finch & Fork: The chefs of Finch & Fork, besides flashing their aesthetically pleasing set-up and cooking their noodles fresh on site, showed off their soy-based ramen with seasoned ground pork, garlic, and homemade togarashi (Japanese chili pepper spice), topped off with chicken fat hollandaise. Special ingredient: Chicken fat hollandaise. Sama Sama Kitchen:The winner of this year’s festival did so by cooking noodles on site and delivering shoyu ramen with bits of chashu (Japanese simmered pork), homemade mayu oil (black garlic oil), and marinated egg. The broth, infused with all types of seasonings and oils, could be a huge possibility as to why they won. Special ingredient: The flavorful hashu. Barbareño: Carefully placing caviar limes and quail eggs on top of the freshly cooked noodles, the chefs at Barbareño prepared ramen with pork that somehow seeped its flavor into the broth. Special ingredient: Quail eggs. Hungry Cat: This restaurant ran out of ramen early. Was it because people couldn’t help but steal seconds? The creation included homemade whole wheat noodles with roasted chicken, sunchoke (the root of a sunflower), dashi broth, egg yolk jam, crispy chicken skin, and mushroom. Special ingredient: Egg yolk jam. Your mouth is probably watering by now. So were those that were at the Ramenfest, where people couldn’t help but drink from the bowls. As proven, all the chefs created ramen so unique and special, it was almost impossible to vote. This was one successful Ramenfest, and I’m both worried, for I can see people fighting each other to get to the next ramen stand, and excited for how next year’s will go.